One in seven prisoners is serving life, according to the new report. camera (Getty Images) Hands grasp the bars in a jail cell in this undated photo. 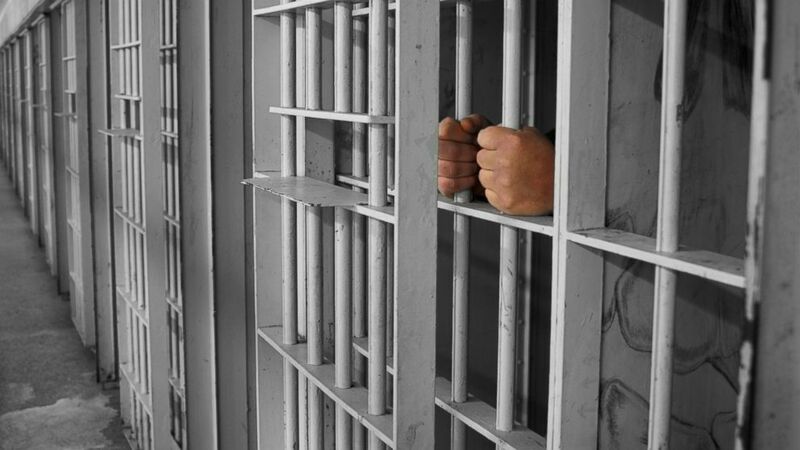 The number of people serving life sentences in U.S. prisons has nearly quintupled since 1984, according to a new report issued by the Sentencing Project, a research group based in Washington, D.C., focused on criminal justice issues. The study found that a record-breaking 206,268 inmates were serving life with possible parole, life without parole or virtual life sentences in 2016 — 1 out of 7 people in prison in the United States. A virtual life sentence, according to the Sentencing Project, is any sentence with the likelihood that the prisoner will die in custody. Within those numbers, the Sentencing Project found that 1 in 5 African-American prisoners will serve a life sentence or the equivalent of a life sentence and that close to 12,000 prisoners of all races are serving sentences for crimes they committed in their teenage years. A news release for the report notes that the trend is occurring while crime rates are dropping nationally and political support for criminal justice reform is growing. Over 17,000 of the inmates who are serving life or virtual life sentences are doing so for nonviolent offenses, according to the report. Ashley Nellis, a senior researcher for the Sentencing Project and the author of the report, told ABC News in a phone interview that the data were compiled from Department of Corrections for every state and the Federal Bureau of Prisons. She said that underneath the numbers is a large bill for U.S. taxpayers, according to her research. "A prisoner who starts his or her sentence in their 30s will, on average, cost the state $1 million per year," Nellis told ABC News. She said that part of the expense of housing prisoners for life is that they become more expensive with age. "Many people enter prison in poor health to begin with," Nellis said. "Then prison itself is hard on a person's health, and they're being cared for into their geriatric years." Daniel Nagin, a professor at Carnegie Mellon's Heinz College who has studied issues of deterrence and crime, told ABC News that sentencing is a complex subject with competing objectives. "One side of how we go about looking at how long people are sentenced is the goal of deterring crime," he said. "Another side is enacting appropriate punishment for wrongdoing." Nagin said there is a degree of political consensus brewing that the number of people serving life in prison has become too costly for taxpayers and that a better balance needs to be reached between deterrence and punishment. "There's no good evidence that increasing already long sentences into old age is a deterrent," he said. "Nature's greatest deterrent is age, and we're turning our prisons into old-age homes." Christopher Seeds, a veteran capital defense lawyer who is writing his Ph.D. dissertation at New York University on the subject of life sentences without parole, told ABC News that favoring harsh sentences frequently plays well for politicians, even if it's not highly effective at stopping crime. Donald Trump and Bill Clinton are examples of candidates who made toughness on crime salient parts of winning presidential campaigns. Seeds said the study indicates to him that there are people serving life sentences who should have their cases reviewed. "There are people in our prison system that aren't getting out, even when they no longer pose a threat to society," he said. He added, "Some of these prisoners might be quite elderly, but they aren't having their cases reviewed. In some cases, these people may have been transformed by their years in prison and could be entirely different people from when they got there."